I had ice cream and a boost to my immunity, too! So there's this shop I've had on my list for a few years now, after reading an article about them in Edible, Manhattan. 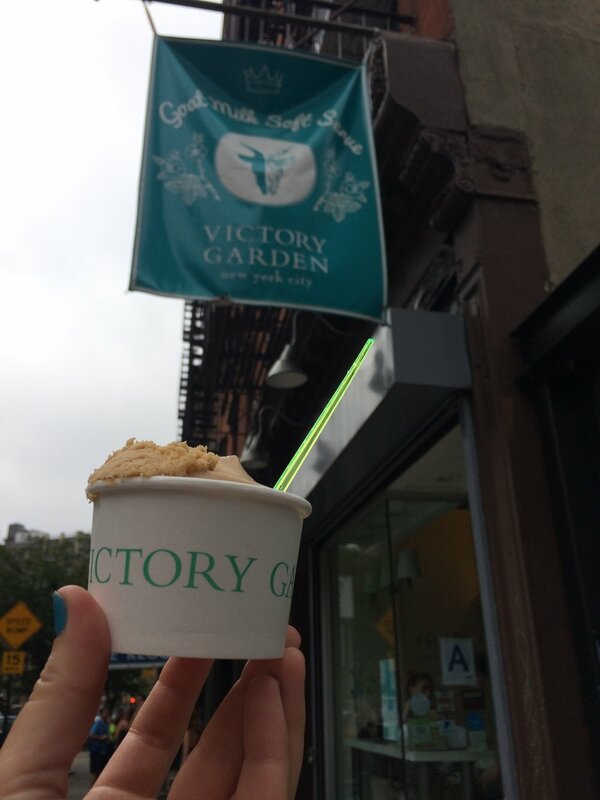 It's called Victory Garden, referencing the owner's real first name, Victoria, as well as the vegetable gardens that sprang up during World Wars I and II to stretch the nation’s food supply. I wasn't so much intrigued by the idea of its product - goat milk soft serve - as the story behind it. According to the article, "In 2005, [Sophia] Brittan spent six months in Beirut studying Arabic (where, for fun, she videotaped a pre-You-Tube-era cooking show) then came to New York to enroll in the French Culinary Institute. But she hungered for the light, sun-drenched flavors she’d fallen for in Lebanon. She especially hankered for the taste of goat’s milk. “There’s something really warm about it,” she said recently. “It’s made on family farms, and I really like its earthy flavor.” By the time Brittan graduated, she had hatched a plan, inspired by dondurma, a famous goat-milk ice cream from central Turkey made with salep, the root of a wild orchid flower. “I love soft serve, but I realized there’s a disconnect,” she explains, referring to the “fake stuff” in standard highly processed offerings. 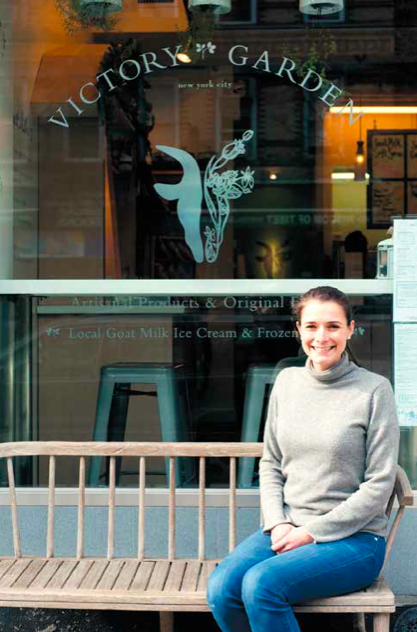 “I wanted soft serve that was healthy and local.” Once back in New York, she set up to open a shop. Doesn't your little entrepreneurial heart just love that story a little bit? An aspiring female chef-turned-entrepreneur to bring to New York a new food by way of the Middle East? I just feel like it's a modern-day Katz's, or Russ And Daughters, or Yonah Schimmel's. Am I being a tad too romantic? Possibly. But we all know that far beyond the ice cream itself, I'm a sucker for a good story. Twice a week she hits the Union Square Greenmarket to source inspiring ingredients and meet new small-batch purveyors. The shop’s lengthy list of local suppliers, from Greenmarket and beyond, includes Side Hill Acres goat dairy in Candor, New York. In fact if you check out their website, it seems every topping or flavor comes from yet another small, local supplier - the honeycomb comes from Liddabit Sweets in Brooklyn, the halvah comes from the famed Sahadi's in Brooklyn. It's a specialty shop in New York, inspired by local middle eastern food, by way of the small, local food community in NY - a full circle of inspiration and support. Still. I will not lie. The goat milk thing was throwing me. I love me some goat milk cheese, but I'm not so sure I wanted my ice cream to taste like it. It has a distinct aftertaste. It's more savory - wanting herbs, pepper, crackers, a nice wine - than say, chocolate and blueberry. But hey. This is the summer for Experimental Ice Cream, so off I went. Now, it's so small-batch that only 4 flavors are available at any given time, until that flavor sells out. Available when I went in were: Salted Caramel, Tangy Goat Milk, Chocolate Mint, and Blueberry Yogurt. None of them flipped my lid, so I asked which was the best. (Guess. Sigh.) I asked if it was good with any toppings, which I normally don't do, but since I wasn't bowled over by the flavor choice, why not. The server told me to add powdered halvah (a tahini candy that tastes like honey), which was a phenomenal tip. I was just in the middle of asking them where the goat milk came from, when the owner Sophia emerged from the back. I loved that she was there, overseeing business on a Saturday afternoon. I introduced myself. She was super kind and friendly, responding to my queries passionately and not in the least put off by my nosiness. What I wanted to know first and foremost was WHY goat milk. She told me it wasn't even a choice specifically; just when she was researching milk for her soft serve - something fresh, pure, wholesome, healthy, and organic - goat's milk was a natural fit and her first choice. That it had nothing to do with lactose intolerance and wasn't meant to be anti-cow milk. Goat's milk is a natural go-to in other European cultures, much more than it is in America. It didn't seem to me that she had thought twice about it potentially being a hard sell. Goat milk is lower in fat than cow’s milk, but with all the nutrition. Goat milk is rich in healthy antimicrobial fatty acids, which are burned by the body, rather than stored as is cow’s milk. Goat milk is a great source of iron, calcium, protein and potassium. Goat milk is lactose friendly, making it easy for people with lactose-intolerance to digest. Goat milk is the most similar animal milk to that of humans and is more readily processed than cow’s milk. AND goat’s milk has the trace mineral selenium in it, a key essential mineral in keeping the immune system strong and functioning normally!! So........duh. In a city filled with Mr. Softee trucks, why WOULDN'T you make soft serve from goat's milk?!?! You're probably wondering how it tasted. Well, I liked it more than I thought I would. There was a lot less of that tangy aftertaste than I had anticipated. The halvah was delicious. I finished the whole thing and only considered that it tasted differently after. I'm not sure it will be something I crave in the near future, but I'm not as put off by it as I once was. Sophia is an awesome lady with a passion for a lot of the same things I'm passionate about, and that I can really get behind. She has succeeded in a competitive industry by being herself and doing things her own way, in a way that made sense to her. So, go get some goat milk soft serve. Or don't. Whatever floats your goat.